Sure is quiet out there. I mean seriously, with a gabillion people online these days, wouldn’t a few even accidentally stumble across your website? Isn’t it statistically impossible (or at least, improbable) that you should have so little traffic to this darn blog that you’ve spent hours coaxing into existence, one precious post at a time? What? Offline rejection isn’t enough, now writers have to be rebuffed online, too? Don’t be discouraged, dear writer, help is on the way! Building traffic can take time. It’s not always easy to find the people who are interested in your topic and receptive to your point of view, your voice and your style. Plus, you also need to consider the “share-potential” of your audience. Do your readers have large followings on social networks like Twitter and Facebook? Or better, do they have their own blogs or websites? Or does your audience (or potential audience) have small networks of the usual suspects: friends, family and a few peers? Be careful when comparing your growth with the internet gurus. If your target audience isn’t bloggers, businesses or online entrepreneurs, the share-potential of your readers will be much lower – and your growth, therefore, may be much slower. Consider changing your goal from quickly growing your traffic, to focusing on ensuring that the traffic you are attracting is right for your author blog. You want the traffic you funnel to your site to be targeted, invested and closely aligned with your way of thinking. And the results you seek – increased book sales, a supportive community, authority and influence in your genre or niche – are not *necessarily* linked to high traffic numbers. The more targeted the traffic you draw to your site, the better your chances of turning visitors into fans. I Know You Want it, But Are You Ready for a Surge in Traffic? Attracting the right people to your author website is important, but a key ingredient in exponential traffic growth is retaining as many of those readers as possible. If you don’t stop the leaks, you end up spending a lot more time and resources than you need to. You’ll need to focus on both to begin seeing an increase in traffic and to start growing your fan base. Before you start desperately eagerly looking for ways to funnel more visitors back to your site, follow the next several tips to ensure that you are fully prepared and equipped to receive your visitors gracefully. Choose your domain name carefully. Having the same blog title and domain name is good for SEO as well as it makes it simpler for people to find you. In most cases, fiction authors should use their name (you’re building a brand and online presence around you, not just one book), and non-fiction authors should ensure their domain and blog title are descriptive, relevant and clear. Avoid difficult spelling, dashes, numbers or words that can have more than one spelling. The easier your domain is to remember, the better. Site design is essential for building trust, authority and credibility. People judge books – and websites – by their cover, so focus on designing a beautiful, functional and professional looking website. A quality look, combined with quality content will lead to a positive user experience which means readers will spend more time on your site and view more pages per visit. The simplest (and least expensive) way to achieve a professional design is by purchasing a premium template and making some small tweaks to reflect your brand style. Ensure the template you choose “fits” with your theme and content, allows you to easily incorporate email opt-in forms, and is accessible and easily viewable across a range of devices (responsive design). Don’t confuse your visitors’ interest in you, with their interest in what you can do for them. It may seem like a subtle difference, but your traffic will increase when you make it abundantly clear what your readers will gain from visiting your site. Determine exactly what you want your visitors to do when they get to your site. Simplify your menu, clean up your sidebar and give one or two calls to action per page. Too many options leads to confusion or overwhelm, so limit the amount of scrolling and clicking that’s required before your reader finds what they’re looking for. Decide the priority of your content or calls-to-action (email sign up, book purchase, share content, etc. ), and lead readers in that direction. To help your work spread, create share-worthy content and make it dead-simple for people to share it with their networks. Add tweetable quotes with click to tweet, add the Pin It button to your post images and choose a social media share plugin (I use Sumo) to encourage those who are enjoying your content to spread the word. Remember, you’re not looking for just any audience, you’re looking for YOUR audience. 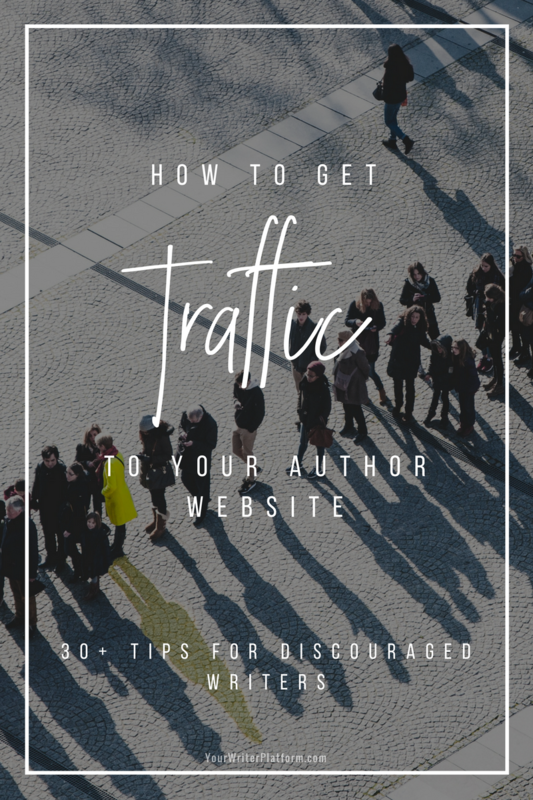 The traffic you drive to your author website will (hopefully) be targeted, but there will still be some “weeding out” once visitors hit your site. You can’t be all things to all people, and by offering specific, detailed and highly valuable content to a particular group, you are necessarily excluding other groups whose ideas and interests don’t align with your message and content. This is okay! Be exclusive. Focus on becoming the must-read resource of your future readers and fans. Think of a headline as your post’s book cover. If your headline isn’t irresistible, your post goes unread. Headlines can make or break your post; readers will use your headline to determine whether or not reading your article is worth their time. If it doesn’t draw them in, pique their interest or offer a clear benefit, you’re out of luck. And, keep in mind that search engines also “read” your headlines, so deftly adding a keyword into the mix is also a good idea. Visuals catch our eye and anchor our attention. Much like headlines, images draw readers in. By incorporating images and graphics that add to the content, you can not only improve the engagement of your readers, but you can generate another traffic source via image search as well. Add your post title and url in your blog post images and include a watermark (with your logo and url), for when they’re pinned or shared. Note: be careful with copyright and giving proper attribution for images that are not your own. Getting your content ready for crowds of online visitors requires some attention to detail. People’s communication and consumption habits are evolving as we struggle to manage the deluge of information that is now accessible at any time, and anywhere. Attention spans are practically non-existent, mobile is taking over, and we’ve developed a “Diva complex”, where we want, what we want, when we want it. So, to maintain engagement, mix photos, videos, and other visuals into your written posts, and format for scanners (use subheadings, bullet points, bolded text to highlight key points). Stick to a conversational tone, skip the jargon and don’t forget to check spelling and grammar. To ensure that people can find your site when they search for your name, your book titles or a related topic, do keyword research to target terms and phrases your audience is typing into search engines. There are oodles of ways to stalk do some friendly recon on other writers and influencers in your genre or niche. One quick way to get some insight into what’s working is to use BuzzSumo to discover the social performance of your “competitors” sites and content. This allows you to quickly identify what topics are resonating with their readers (and the readers you seek). Emulate that kind of content to draw readers to your site. Even the highest profile writers and bloggers are looking for more traffic, more attention for their work and for more ways to get their ideas to spread. So, when it’s relevant to do so, link to authority sites in your articles. Try post round ups, a listing of your favourite author sites, or reference particular posts that enhance or clarify points made in your posts (make sure to send those you reference a quick email to let them know about it). Frequently reference your own posts as well (internal links). This will help draw people in and keep them on your site longer, while at the same time sending a signal to search engines about those posts. And if other writers, bloggers or influencers have already linked to your site, THANK THEM! They obviously enjoy what you have to offer, so make sure they know you appreciate the mention. Include your blog’s URL on all your profile pages: Twitter, Facebook, Goodreads, Flickr, LinkedIn, Pinterest, etc. Add a watermark (name and website URL) on any photos or graphics you create and if you upload videos to your YouTube channel, make sure to add a link to your website in the description below the video. Tie everything you produce online back to your blog. People like to be a part of something that’s worthwhile, so encourage your visitors to weigh in and speak their minds. Stimulate conversation by implementing a robust commenting system and respond thoughtfully to any comments. Provide the ground rules for participation, and make it clear that your community supports a safe and respectful environment for people to share their thoughts and opinions. An invaluable source of data on almost every aspect of your site, Google Analytics will help you determine who visits your site and when, which sources refer high quality targeted traffic, and what posts and pages are most popular. Interpreting the data gleaned from your analytics will help shape the direction of your content and promotional plans going forward. There is much debate in the blogosphere about how often you should be posting new content to bring in the most traffic. It used to be that the more you post, the more traffic you could expect. Nowadays, posting schedules seem to be considerably more flexible and much more dependant on individual audiences. If you’re a superstar, and can pound out content five+ days per week that is highly relevant and engaging to your audience AND can be comfortably and willingly consumed by said audience – go for it! For the rest of us mere mortals, a regular and consistent posting schedule of your best stuff once a weakfish, works just fine. It’s much better to ensure quality content then just to post to meet the schedule (but also important to push a little outside your comfort zone). The best way I’ve found to effectively use limited “online-presence-building” time, is to create a content calendar. By mapping out a few weeks (or better, a few months) worth of post topics at a time, you rarely find yourself staring at your computer, wondering what to write about. Now that your website and content are optimized to not only catch, but direct traffic down the appropriate paths, it’s time to open the faucet! Build your author brand by filling out your profiles to the fullest extent, linking back to your website, staying consistent with brand colours and photos, and sharing content that your readership will find valuable. Choose a careful combination of platforms where your potential audience is active AND that you actually enjoy using. It will take time to build up a network, so don’t choose a platform you find frustrating or painful to interact on. Start following industry influencers, connectors and the followers of those writers and bloggers who have the audience you seek. Share other people’s content (they’ll notice), share your own content, and start or encourage interesting conversations that go deeper into your topic or genre. Be social, be authentic, and work towards gaining trust rather than racking up your follower count. You can gain authority by not only sharing your expertise, but by curating and sharing the expertise, insights and opinions of others in your field. Cite influencers (and @mention) when you share their work on social media or reference them in your post. The more you share other people’s content, the more likely they are to share, Retweet or reference your content (because it increases their authority). Actively participate in groups or forums, answer questions, and engage with your readers. LinkedIn is a valuable publishing platform in its own right. Post content to LinkedIn to boost traffic as well as increase your profile within your industry. Join groups relevant to your genre and offer valuable advice, ask relevant questions, and share thoughtful opinions. Be careful to adhere to the group rules when/if posting links to your work or website. Join or consider starting a genre or niche specific Facebook group where members can ask questions and get support. Point them to additional resources and – when relevant – posts on your site. If you’re not already an avid reader and thoughtful commenter of other blogs in your genre, then it’s time to get started. Reading what other writers and industry influencers are sharing on your topic, as well as “listening” to the questions, concerns and feedback that they are receiving from their readers is a golden research – and relationship building – opportunity . Determine the communities and blogs where your readers already gather. Listen, answer questions and participate by adding your own insights and ideas. Remarkable comments stand out – both to readers and to blog owners. Blog readers may click on your link to find out more (increasing blog traffic and your own site’s visibility), and relationships with blog owners can be made that may lead to future traffic (a popular blog Retweeting your post, or guest blogging opportunities). Aside from social media groups, there are numerous online and offline writing communities that you can build connections with. Do a Google search for writer’s groups, guilds or retreats to see if anything pique’s your interest. Search for groups specific to your topic or genre, and look for local groups or meet ups. Networking with other writers in your community, as well as cross-promoting your work and your website with others, will give you access to new audiences and help grow traffic to your site. Guest posting is one of THE best ways – particularly when you’re just starting out – to spread awareness of your author brand to new audiences. It allows you to “share” the audience of a more popular site, generate links and references back to your author website (which helps your search engine rankings), and often gives a you a big boost in traffic for a few days after the post goes live (the better you’ve done at optimizing your website above, the more of these new visitors you’ll retain). You draw new readers to your site, those readers benefit from fresh, relevant content, and you build contacts with other bloggers and writers in your niche. Win, win, win! Sometimes increasing your traffic requires a little spy work. Setting up Google Alerts for your name, the name of your site, book names and so on, will help you to track who’s talking about you and what they’re saying. Use this intel to follow up with a thank you, or to open the door for a more formal introduction. Get some free publicity by answering a HARO query. Help a Reporter Out (HARO) is a website that allows you to showcase your expertise in your respective field by responding to journalist queries on your topic. Establish relationships with reporters and other potential industry collaborators. A good relationship with a few journalists is worth a thousand press releases. Your efforts could result in significant referral traffic, increased authority and high quality links back to your site. For more, read Copyblogger’s 109 Ways to Make Your Business Irresistible to the Media. A reader has just read your book from cover to cover. Their engagement level is high and they’re most likely looking for more. Do not waste the opportunity to help your reader to more of what you have to offer! Capitalize on your reader’s interest by providing a link to your website (your home page, or your books’ summary and sales page), and to your email list where they can grab a super relevant and enticing opt-in incentive or bonus offer. One of the most important investments you can make toward the growth of your writing career (and your website traffic) is to start building an email list of like-minded and eager supporters. Don’t assume that even those that love your site will find their way back again. Most won’t, and that represents a huge loss in opportunity. Grow your audience and community and then ensure you’re contacting them regularly with highly valuable and interesting content. Email your list when you post a new article, create an autoresponder series that directs subscribers to additional resources and pillar posts on your blog or create a newsletter that your audience will clamour for. Use your list to gather intel and feedback, ask questions, give surveys – discover your readers’ pain points or what they’d love to hear more about. Then give it to them! Draw people to your site by creating a stellar opt-in incentive, and offer “member only” content. Build a community and make it exclusive. Don’t forget to add a signature to your outgoing emails, promoting your blog or most recent post. 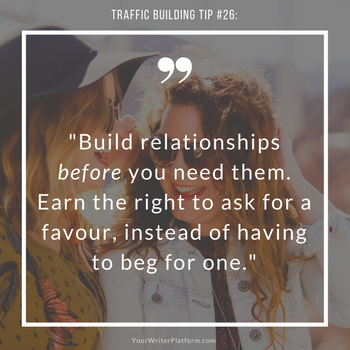 There is a repeating theme when it comes to generating traffic to your site: build relationships before you need them. In-person meetings, offline events, speaking engagements, clubs, mastermind groups, conferences and so on, are all hot beds of opportunity. You never know who you are going to meet that may be the catalyst for your career expansion. By working on these relationships now – before you desperately need them – you have the time to cultivate friendships and business partnerships that are authentic and mutually beneficial. You’ll have earned the right to ask for a favour, instead of having to beg for one. Attending events may lead to guest post opportunities, increased traffic and shares, and even business tips and ideas. Hosting events, including contests and giveaways, blog carnivals, launch parties, webinars and training seminars will also grow traffic and extend your influence. You would think that this would be an obvious one, but adding your website URL to EVERYTHING you use to market yourself and your work is often overlooked – particularly with offline marketing materials. Double check that your author website URL is clearly printed on any bookmarks, postcards, flyers, business cards, or handouts and encourage people to head to your website for more. You could add the URL for your email sign up, and entice people even more by boldly advertising your opt-in freebie. The more relevant and highly valuable your content is perceived to be, the more likely it is to spread. Knowing your audience well is critical to creating content that resonates. Optimize your older content by updating it, linking to it from newer posts, promote it again on social media, or add additional content and visuals. Try your hand at crafting highly shareable infographics. If your ideas can be represented in visual form, infographics can help your ideas spread. Find the post types (list post, video post, response post, landmark post) that work best with your readership. Mix it up and try new things (evergreen or pillar articles vs. timely or trendy articles) to see what drives more traffic to your site. Develop a series or a 30 day challenge to capture and hold attention, as well as encourage participation. Add your input to popular conversations in your genre; what’s a hot topic right now? Shoot a quick email to the blogger or writer your post references; they may link to you or share your viewpoint. If your post is highly relevant to a particular group or organization, send them an email to let them know about it. Curate the best of the best in your niche. When you publish the top or the “best of” in a a field, everyone who is ranked highly shares and links to it (again, make sure to let them know that you’ve featured them). The key to good promotion: write great content and let the right people know about it. Remember that social media, email and the connections you’ve made to this point can all help you maximize the reach of your fabulous content. 29. Have You Heard About This Little Video-Sharing Site Called YouTube? With 1 billion users and over 6 billion hours of video watched per month on YouTube, you may want to consider ways that you can utilize video in your posts (and in your overall marketing strategy). YouTube is an excellent way to grab and hold your audience’s attention and boost traffic. It also allows you to reach a different subset of your market that written posts alone may not reach. Of course, it’s not as simple as just slapping up a video and BOOM – you’re internet famous. For additional YouTube conquering strategies, here’s my favourite YouTube “how-to” guy, James Wedmore. Many of the tips above have included networking or working in collaboration with others to help boost traffic, but I do think partnering with other writers and professionals deserves its own section. Joint product creation (including courses, offline training and guides), co-writing projects, webinars or teleseminars, interviews, co-hosting podcasts, virtual book or blog tours, affiliate promotions and sales, working with charities or other organizations – all can have a significant impact on the growth of your traffic and writing business. Partnering allows you to share audiences, cross-promote products and services, and develop content that you may not have been able to produce on your own. This may be considered a more advanced traffic building strategy, with the return on investment somewhat more variable for each individual author than the previous tips. Authors have experienced mixed results when it comes to determining the success of their paid promotional campaigns, so it’s up to you to test and validate whether this particular strategy fits with your traffic generation goals. And here’s another interesting post on paid advertising that raises some questions you should consider for determining gain vs. costs. If you’ve been struggling for awhile to increase traffic to an eerily quiet blog – hang in there! By implementing even a few of these tips, you’ll find that your audience will start to build, one happy fan at a time. And if you have seen some growth in your site traffic recently, please share a few of your tips below in the comments. If you’ve tried any of the above, what were your results? This complete author business planning system is designed to specifically address the needs of writers working to build their platforms and author businesses – everything from tracking daily word counts and book sales, to strategic marketing, launch planning, and developing your author brand. This is by far the best post I’ve read on getting traffic to a writers blog. I really liked what you said about quality not quantity, as I think while I’ve been generating a reasonable amount of comments on my blog, in the past it’s not necessarily been readers who are interested in my site per se, but commenting for reciprocal comments – which is great as far as it goes, but has it’s limitations. And I love your slide share presentations. I have google alerts for words like writer & author to check out what going on, but never considered putting my own name in there – duh! Thanks so much for an awesome post!!! And what you note about the comments you’ve been receiving is interesting. If it’s obvious to you that these commenters are expecting something in return, see it as a cautionary tale – what not to do yourself. There’s no harm in having a loose agreement with others about reciprocal commenting to get the conversation going, but if that’s all the action your comment section sees, then it’s defiantly important for you to start implementing some of these techniques to extend your reach past your immediate network. Finally! Thank you for your very relevant, information-packed, helpful, hope-giving, clear & concise article. Cheers! You’ve given me a lot to think about! I find blogging overwhelming and you gave me practical advice to follow. Thank you! Thanks for the article. It’s comforting to know I’m already doing some of this stuff, and nice to see a few tips that I didn’t know. Now, back to re-building my name site, which I hope to have launched by 10/10…. What strategy (or combination of strategies) do you find works best to drive traffic to your site? Hey Kimberley! I agree with you on how authors struggle with driving traffic to their sites. It’s great that you provided all these actionable tips to help remedy that. Thank you! On that note, I’d love it if you could share maybe 4-5 author websites that have met the criteria, so to speak. Could you share some real-life examples of authors doing an amazing job in driving and growing their traffic to their author sites? KatieDavis.com – uses her blog and Youtube to build her email list and drive book and course sales. I am glad that you included at least a few fiction authors. I write nonfiction and fiction (under 2 identities) and I find blogging about nonfiction and getting readers to the blog much easier than for fiction. Yes, Brida, I think most people would agree that it requires a different plan of action when you’re talking about building a fiction writer fan base. Often, fiction writers haven’t identified the wants, needs or desires of their target audience clearly enough (if they’ve even identified their ideal reader at all), so attracting the right crowd becomes tricky. There is also the problem of writing in more than one genre or having no book available yet, that makes content creation more challenging for some fiction writers. What is your #1 traffic driver for your fiction audience? And for your non-fiction audience? Many thanks for your concise and relevant info! Glad you liked the post, Akintunde! So much great information! I appreciate your emphasis on targeting the right audience. It has made me stop and really consider this step. It is the foundation of everything. Oooo, I couldn’t agree more, Carolyn! Few of the writers I talk to can tell me exactly who it is that they are trying to reach (and why). Usually I get a very broad, fuzzy description, or worse, they have absolutely no idea. This is why everything from marketing and promotion, to content creation and networking for these authors becomes an impossibly difficult endeavour. Good for you for recognizing how important this step really is. Thank you so much for this. This is absolutely the best post I’ve read on how to build your tribe, blog, traffic, and trust with readers. Great pratical advice that I will follow through on! This list is so complete and so helpful. Outstanding post, Kimberley. Thank you! BTW, completed my transition to a self-hosted WordPress site using BlueHost, and I am so happy that I did. Hope you’ll take a look. In appearance I kept the theme I was using (crisp, clean, readable) but I now have the ability to use plug-ins, etc. which improve so many things behind the scenes. Thanks for your help! But I’m happy to do it because of feedback like yours, Sherrey. Congrats on the move to a self-hosted site – I’m sure you’ll find it to be much more flexible going forward. One quick thing I noticed on your site is that you have two email opt-in forms (one just above the other) in your sidebar. Yay for encouraging email sign-ups, but it may be confusing for your readers to have two so close together. Maybe move one a little lower down in your sidebar, or add one to the end of your posts (yep, there’s a plugin for that 🙂 ). What an extremely helpful piece of work. I can’t thank you enough. I am going to forward it to many writer/friends. This is one of the best features I have read on the subject. Thank you so much for the awesome advice. Wow! there is a great deal of useful information here. Thanks for sharing. I just posted my author website a couple of months ago and not much traffic I can see, but I’m hopeful. And congrats for taking the leap and going live with your author website!